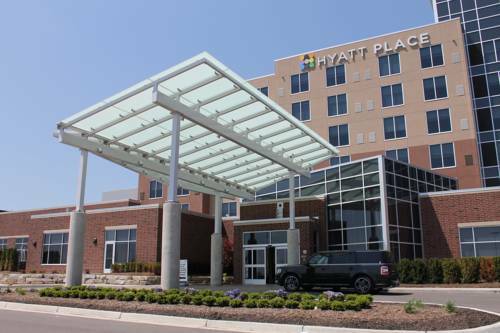 Hyatt Place Novi has 124 guest rooms, 2 suites and is connected to Suburban Collection Showplace a 215,000 Sq Ft Expo Center and The Diamond Center with 30 meeting rooms and a ballroom with a capacity of 2,200 people. The Hotel is located 30 mins from Detroit Metro Airport accessible from I96, I696 and I275. Enjoy our complimentary a.m. Kitchen Skillet, with hot breakfast items, fresh fruit, oatmeal and plenty more to choose from. Pet policy: 1-6 nights a 75 non-refundable fee. 7-30 nights a 75 non-refundable fee plus an additional 100 cleaning fee. Maximum of 2 dogs per room are permitted. Weight must be 50 lbs or less max of 75lbs per rm. Fees are in USD. Service Animals exempt from fees. The Hotel is located 30 mins from Detroit Metro Airport accessible from I96, I696 and I275. Carrabbas in Novi offers flavorful, handmade Italian dishes prepared to order in a lively exhibition kitchen. Guests enjoy Carrabba family recipes handed down for generations. Bar Louie is an eclectic urban bar with warm surroundings, filled with nightlife photography, hand-laid tile artwork and other local architectural touches. Famous handcrafted martinis, exceptional selection of American food. For non-stop excitement and entertainment, Andiamo Novi is the place to be scene! Featuring all the fine dining and extensive wine menus our other Italian family restaurants have to offer. Hello and welcome to Bonefish Grill - your local seafood restaurant in Novi, MI! Our anglers are here to ensure your Bonefish Grill experience is outstanding each and every time you visit. Whether its a romantic dinner for two or a large family celebration, The Melting Pot of Novi is the ultimate gourmet fondue restaurant to dip into something different. Kims Garden Authentic Chinese Seafood and Dim Sum Restaurant has been serving up delicious Cantonese-style cooking for over 30 years. The Compuware Arena is a multi-purpose arena in Plymouth Township, Michigan, opened in 1996. The DTE Energy Music Theatre is a 15,274-seat amphitheater located in Clarkston, Michigan. Ford Field is an indoor American football stadium located in Downtown Detroit. It is the home field of the National Football League's Detroit Lions. It is owned by the Detroit-Wayne County Stadium Authority. MGM Grand Detroit serves up a premier gaming experience. With over 90 table games, 4,000 of the latest slots and video poker machines, plus Detroits premier non-smoking poker room, MGM Grand Detroit is the place to see and be seen. The Music Hall Center for Performing Arts is a 1,700-seat theatre located in the citys theatre district at 350 Madison Avenue in Detroit, Michigan. The Palace of Auburn Hills, often referred to simply as The Palace, is a sports and entertainment venue in Auburn Hills, Michigan, a suburb of Detroit. Opened in 1988, it is the home of the Detroit Pistons of the National Basketball Association. Detroit Metropolitan Wayne County Airport, usually called Detroit Metro Airport, Metro Airport locally, or simply DTW, is a major international airport in the United States covering 7,072-acre in Romulus, Michigan, a suburb of Detroit. At the Diamond Center in Novi-Detroit you will experience an elegance that will create a memorable event for your special celebration. Stunning ballrooms, award winning cuisine, and experienced wedding planners. Suburban Collection Showplace is the largest, privately-owned exposition, conference and banquet center in Michigan. The brand new, state-of-the-art facility sits on 55 acres of land directly off of the I-96 expressway in Novi, Michigan.